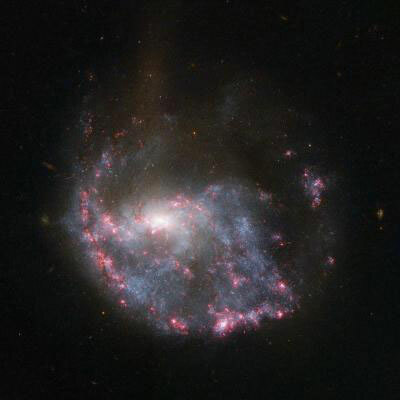 (Nanowerk News) In Hubble's image, NGC 922 clearly reveals itself not to be a normal spiral galaxy. The spiral arms are disrupted, a stream of stars extends out towards the top of the image, and a bright ring of nebulae encircles the core. Observing with NASA's Chandra X-ray Observatory reveals more chaos in the form of ultraluminous X-ray sources dotted around the galaxy. Hubble's image of NGC 922 consists of a series of exposures taken in visible light with Hubble's Wide Field Camera 3, and in visible and near-infrared light with the Wide Field and Planetary Camera 2.